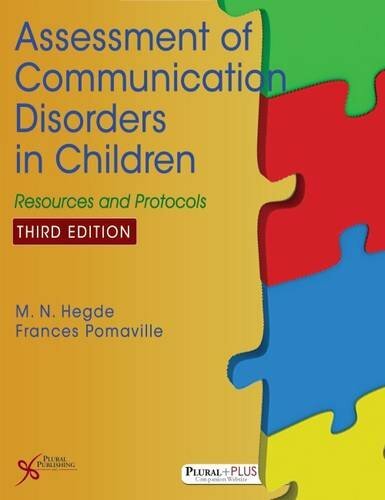 1597567841 –Assessment of Communication Disorders in Children: Resources and Protocols, Third Edition offers a unique combination of scholarly information, invaluable resources, and time-saving protocols on assessment of communication disorders in children. Most resource books offer limited research and scholarly information, thus making them unsuitable as textbooks for academic courses on assessment and diagnosis. Similarly, most traditional textbooks do not include practical, easy-to-use, and time-saving resources and protocols that the practicing clinicians can readily use during assessment sessions. By combining the strengths of traditional textbooks with newer assessment resources and protocols, this one of a kind book offers a single, comprehensive source that is suitable as a textbook and useful as a practical clinical resource. *NOTE:* This book comes with supplementary content on a PluralPlus companion website. If you purchase or rent a used copy of the printed book, the code to access the website printed inside the book may have been previously redeemed/used or be incorrect and you will not be able to use it. To guarantee access to the website, it is recommended you purchase a new copy of this book directly from Amazon or the publisher, Plural Publishing.